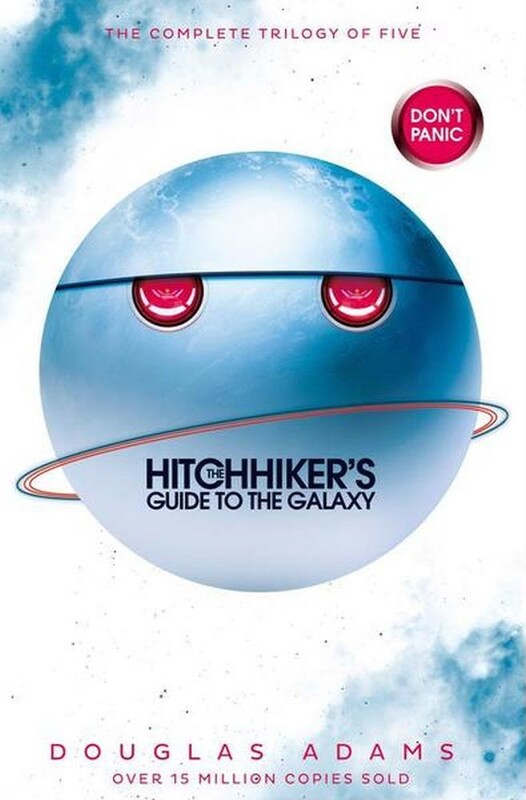 DON''T PANIC: collected together in the Hitchhiker''s Guide Trilogy are the five titles that comprise Douglas Adams'' wildly popular and wholly remarkable comedy science fiction series, with a special introduction from the author and bonus short story, Young Zaphod Plays It Safe. One Thursday lunchtime the Earth gets unexpectedly demolished to make way for a new hyperspace bypass. For Arthur Dent, who has only just had his house demolished that morning, this seems already to be rather a lot to cope with. Sadly, however, the weekend has only just begun. The Galaxy may offer a mind-boggling variety of ways to be blown up and/or insulted, but it’s very hard to get a cup of tea. When all questions of space, time, matter and the nature of being have been resolved, only one question remains - ''Where shall we have dinner?'' The Restaurant at the End of the Universe provides the ultimate gastronomic experience, and for once there is no morning after to worry about. Following a number of stunning catastrophes, Arthur Dent is surprised to find himself living in a hideously miserable cave on prehistoric Earth. However, just as he thinks that things cannot get possibly worse, they suddenly do. An eddy in the space-time continuum lands him, Ford Prefect, and their flying sofa in the middle of the cricket ground at Lord''s, just two days before the world is due to be destroyed by the Vogons. Escaping the end of the world for a second time, Arthur, Ford, and their old friend Slartibartfast embark (reluctantly) on a mission to save the whole galaxy from fanatical robots. Not bad for a man in his dressing gown. There is a knack to flying. The knack lies in learning how to throw yourself at the ground and miss. It''s not an easy thing to do, and Arthur Dent thinks he''s the only human who''s been able to master this nifty little trick - until he meets Fenchurch, the woman of his dreams. Fenchurch once realised how the world could be made a good and happy place. Unfortunately, she''s forgotten. Convinced that the secret lies within God''s Final Message to His Creation, they go in search of it. And, in a dramatic break with tradition, actually find it . . .
Arthur Dent has settled down on the small planet Lamuella and has embraced his role as a Sandwich Maker. However, his plans for a quiet life are thrown awry by the unexpected arrival of his daughter. There''s nothing worse than a frustrated teenager with a copy of the Hitchhiker''s Guide to the Galaxy in their hands. When she runs away, Arthur goes after her determined to save her from the horrors of the universe. After all - he''s encountered most of them before. This publishing phenomenon began as a radio drama and now exists in a number of wildly contradictory versions (including a TV series, a movie and a towel) - this version, produced by Douglas Adams'' original publisher, is, at least, definitively inaccurate. Douglas Adams was born in Cambridge in March 1952, educated at Brentwood School, Essex and St John''s College, Cambridge where, in 1974 he gained a BA (and later an MA) in English literature. He was creator of all the various manifestations of The Hitchhiker’s Guide to the Galaxywhich started life as a BBC Radio 4 series. Since its first airing in March 1978 it has been transformed into a series of best-selling novels, a TV series, a record album, a computer game and several stage adaptations. The Hitchhiker''s Guide to the Galaxy''s phenomenal success sent the book straight to Number One in the UK Bestseller List and in 1984 Douglas Adams became the youngest author to be awarded a Golden Pan. He won a further two (a rare feat), and was nominated - though not selected - for the first Best of Young British Novelists awards.